ABBE Laboratories now offers an Acne Treatment System for Problem Skin by End-Zit®. Gentle, yet effective dermatologist recommended skin care regimen to control acne. 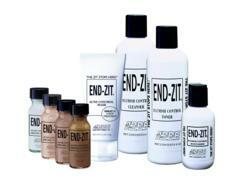 End-Zit® Acne Control Program is an effective therapy to clear up acne. Consisting of a Cleanser, Toner, Moisturizer, Mask and Acne Drying Lotion, the End-Zit® Acne Control Program will help skin look great. About: ABBE Laboratories , the manufacturer of the End-Zit® family of products, is an FDA-registered, cGMP-compliant manufacturer of Private Label, OTC and cosmeceutical skin care formulations. Servicing Spas, Medical Offices and marketers. Paraben-Free formulations. Actives include Peptides, Vitamins, AHA's, Retinols, Anti-Oxidants, etc. ABBE manufactures Creams, Lotions, Serums, Gels. Small to medium runs filled in Tubes, Bottles & Jars. Your formula or ours. Contact us today 1-800-457-0990, e-mail info(at)abbelabs(dot)com, ABBE Laboratories, Inc.